Two ex Avid UK employees have seen an opportunity to put their experience and contacts to good use and have set up Resurface - an console and control surface marketplace. Ben Nemes and Tim Hurrell between them have over 50 years’ combined experience, and they have set up Resurface to connect buyers and sellers of audio consoles and control surfaces around the world. Their aim is also to connect users of the site to a wider collection of services, including news and articles for its professional audio audience. What Is My Old Console Worth And Who Will Buy It? After many years in this industry, we were very aware that – whilst digital systems have been an industry standard for over 20 years – the secondary market for this technology and all related services is so highly fragmented that it doesn’t function. All high-value equipment purchases represent assets that owners periodically want to upgrade, cross-grade, dispose of or acquire in a secondary market. Occasionally, audio professionals simply need to understand the current market value of what they own. We’ve understood from many customers and resellers in this field that there’s a natural demand for this function that’s not currently being met. With audio technology being so highly-specialist in nature, buyers and sellers often require assistance with commissioning and decommissioning, shipping, installation, training and with finding freelance operational talent. With the combination of our services and supporting knowledge, we’re offering tangible benefit to customers making their living at the highest end of the professional audio community. There are already a number of consoles and control surfaces on the books at Resurface, but the star of the show at the moment has to be the Harrison MPC4D triple-operator digital film console that was in Sony's Cary Grant Theatre and has been recently retired from duty after a glittering career mixing over $8 Billion in box office receipts. This MPC4D has been the console in Sony Pictures' flagship theatre since 1999, it comes as no surprise that this console was used to mix some of the highest grossing and most critically acclaimed feature films of recent years, including instalments of the Transformers, Terminator, Spider Man and Pirates of the Caribbean franchises. The team at Sony have meticulously maintained and upgraded this classic console right up until its final session. Although originally installed in 1999, this is not simply a 17-year-old console with 17-year-old components and specification. Far from it, we understand that Sony have spent significant amounts of money upgrading both the surface and the back end over the course of its service. Most recently in 2008 with the addition of 25 LCD meter bridges, upgraded DSP, new frame and new panel fascias. Resurface have had discussions with Harrison about future options for this console and Harrison have confirmed that future owners would have the option of engine upgrades to the current X Range standard and the ability to add additional engines to the MPC4 surface which would open up the opportunity to convert this into three separate consoles. The classic Harrison DFC4D was replaced with the 1000th Avid Pro Tools S6 control surface to be sold. 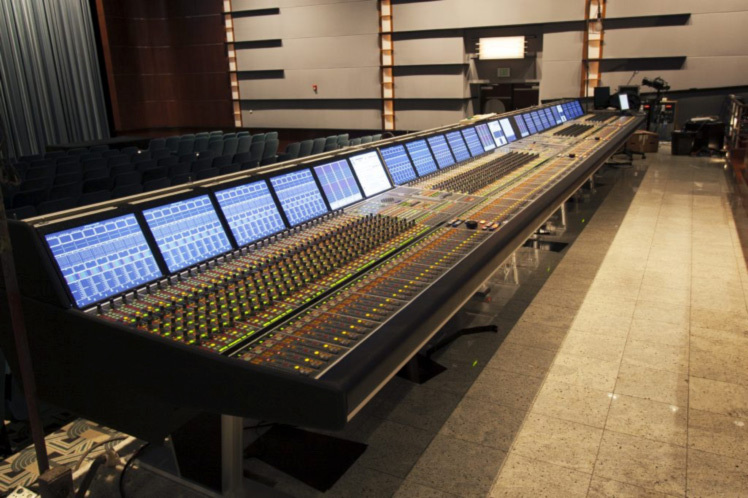 Sony Pictures installed a Pro Tools S6 control surface in its 158-seat Anthony Quinn Theatre in September 2015 supplied by RSPE Audio Solutions. However this suite has been so busy that the Sony Pictures post production facility in Culver City, California has purchased another console for the 367-seat Cary Grant Theatre, the largest of its 10 rerecording stages. You can read the full story on our dedicated Avid S6 microsite. Want A Brand New Euphonix System 5 Console? Resurface have what is probably an unique opportunity to buy the last brand-new-still-in-the-box Euphonix System 5 Console. We understand that this unit is still in the original shipping packaging, brand new, yet to be opened and configured. You can learn more about the Euphonix System 5 console on the Resources page of the Resurface site. Want To Explore What Your Console Is Worth? Another example of what Resurface can do is the ability for a console owner to put up a classified posting on Resurface and explore what their existing console might be worth, knowing that other potential purchasers will be visiting the site to see what might be on the market. Console owners can choose to do this with anonymity as it could be commercially insensitive to go public on the fact they might be selling their console, causing their clients unnecessary angst as well as publicising to their competitors what they might be planning. As an example there is a DFC on Resurface, as the current owners are considering what they might want to do with it, should they upgrade, maybe go 'in-the-box', maybe look at another console, or it maybe that as a result of their toe dipping experience, they realise that it is worth more to them where it is, and their competition and customers will be none the wiser that it ever was considered. Resurface have also identified that there are not only potential customers looking to sell a console so they can go in-the-box and get a control surface like the Avid Pro Tools S6. There are people who are looking to sell their D-Commands to invest in a new control surface and Resurface are ready to help those customers too. Bought A Console - Now What? Once you have bought a console or control surface, you will need to ship it and install it. Maybe if its an old classic console, it will need some tender loving care bringing it back to 'as-new'. Or once you have shipped it you need specialist help to install it, Resurface has contacts all over the world to help you with these challenges too.